Lens Description: Mamiya Macro 120mm f/4 Manual Focus "D" Lens for the 645 AFD-II - Mamiya now makes an improved version of their older and very successful 120mm /f4 macro lens. The big change with this lens is the improved digital communication with their 645 AFD-II SLR. The transfer is handled via a 16-bit CPU instead of the older 4-bit CPU. 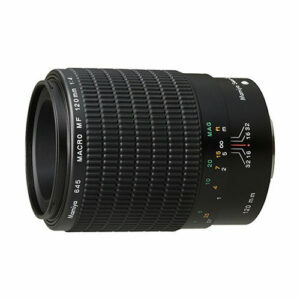 Digital macro photography has now been taken to the next step with this newer generation lens. Mamiya lenses are quality controlled at all stages. They are engineered for professional use. Mamiya manufactures its own glass and coats the lens elements using Mamiya's proprietary multi-coating process, increasing light transmission, dramatically reducing flare, and ensuring crisp, clean whites and vibrant natural colors.